NEW YORK—Famous British writer, philosopher, and composer Roger Scruton believes that beauty in art does matter and that the modern art of the 20th century has largely lost that beauty. A BBC documentary from 2009 vividly detailing Scruton’s views on beauty and art is slowly but steadily spreading on the internet. For Scruton, beauty is not in the eye of the beholder, it is an objective truth—a classical notion, but one that is completely revolutionary in today’s art marketplace. Take for example Sotheby’s recent sale of Mark Rothko’s seminal “No.1 (Royal Red and Blue)” for $75 million. The work consists of little more than a few rectangles of coordinated colors. Anyone who is not told the value of such art would find it difficult to identify it with beauty or beauty with any type of dollar value. The realization among artists and non-artists alike is increasingly that the emperor, in this case the art market, is wearing no clothes. Who can really respect an “emperor” who insists his parading, naked body is cloaked in the finest of garments. To the clearheaded, he’s delusional. 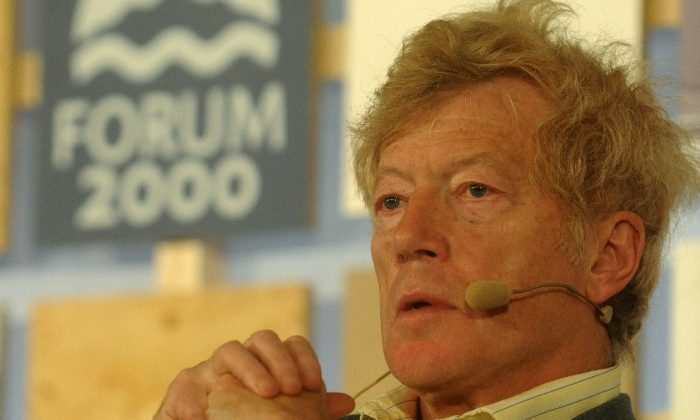 “One day the knowledge that the emperor has no clothes will spread, and the market will crash – but only temporarily,” said Scruton in an email interview. The true aesthetic value, the beauty, has vanished in modern works that are selling for millions of dollars. In such works, by artists like Rothko, Franz Kline, Damien Hirst, and Tracey Emin, the beauty has been replaced by discourse. The lofty ideals of beauty are replaced by a social essay. Some of the artists he picks as the greatest include Titian, Tintoretto, Rembrandt, and Corot. “Good art appeals to what is best in people, and sets them on the path to self-knowledge,” he said. Scruton’s simple yet powerful vision is a return to the best of classical arts. Let’s face it, Scruton is right, the emperor looks much better with clothes on.